This clumping evergreen bamboo is known for its swollen nodes or 'Buddha's Bellies' and is a sensational feature plant, suited to pots or plant straight out in the garden. Leaves are 20-30 cm long and 3-5 cm wide. Bamboos are also great screens/hedges and useful for erosion control (due to the matted roots). Note bamboos lose leaves during cooler weather. Full sun to part shade to indoor low light. Its growth is slow in the winter and it is part deciduous. Can be grown in a pot/indoors for a few years but needs a large pot for maximum growth. Once established outdoors this bamboo is moderately frost tolerant and can handle -4C. 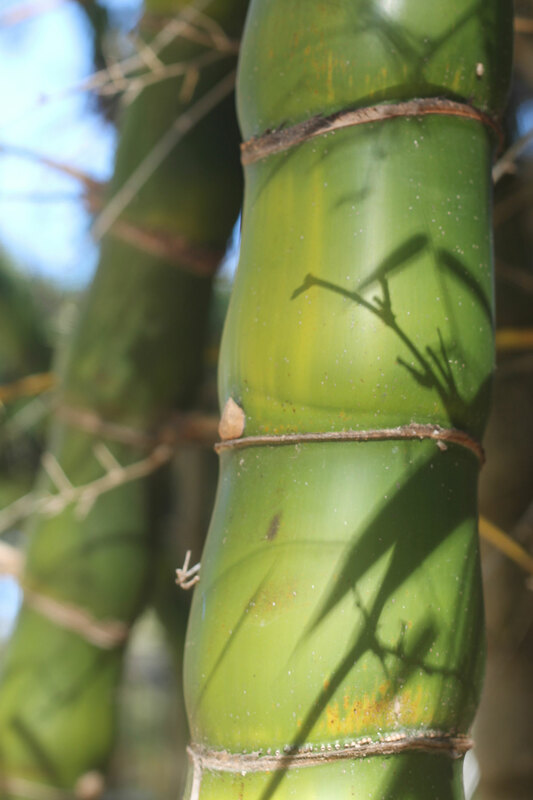 Most bamboos are happiest in a moderately acidic loamy well drained soil. If relying on natural rainfall, growth will be greatly enhanced by consistent watering, an annual application of thick mulch, and fertilising several times throughout the year (use natural organic types or lawn fertiliser). Over time the bamboo will create its own layer of mulch from fallen leaves.